If you have missed the opportunity to watch the SAFF Women's Championship final between Nepal and India on 22 March, you will have a second chance now, and we will give you all the details you need ! It’s in an incredible atmosphere at the Sahid Rangashala Stadium in Biratnagar, Nepal, that the final of the SAFF Women’s championship took place on 22 March. 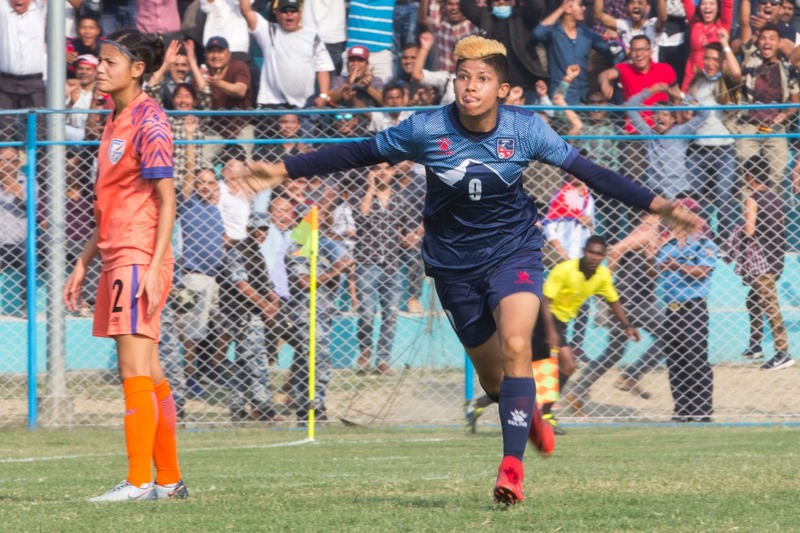 The stakes were high between the two teams as a month ago, Nepal had their first ever win against the Indian giants, with Sabitra Bhandari being the hero, scoring a brace. This time again, lifted by the home crowd, the Nepalese started better. They even scored a goal which was finally refused for an offside (10’). But the Indians quickly took control of the game and it is quite logically that Dalima Chhibber scored on a fantastic free-kick (26’). However, the locals managed to fight back : once more Sabitra Bhandari did the job, heading the ball in the nets on a long ball. The crowd went then ballistic, believing again their team could win the final. But the reigning champions came back from the locker rooms with more ambition. A little after the hour, Dangmei Grace put her team in front, connecting with a marvelous through ball of Sanju and keeping composed to score calmly. The coup de grace came at 78’ when substitute Anju Tamang scored the 3rd one for India. Indumathi Kathiresan headed the ball into the path of substitute Anju Tamang in the 78th minute, who held off a weak challenge to score India's third goal and seal the win. In a final, in general it is said that the first goal scored is crucial. In this case, one sure thing is that it was quite a strike. Dangmei Grace was fouled a good 35 meters away from the goals and left the ball to Dalima Chhibber. Everybody was expecting a cross but the Indian Rush FC midfielder took a huge shot which caught by surprise - and by strength! - the Nepalese goalie to end up in the top opposite corner ! "I am extremely proud of all of you. I have always maintained that the women’s team is much better than the men's. Go there, and give your best in Myanmar. I have been keeping a track of all of you playing. Keep up the good work."